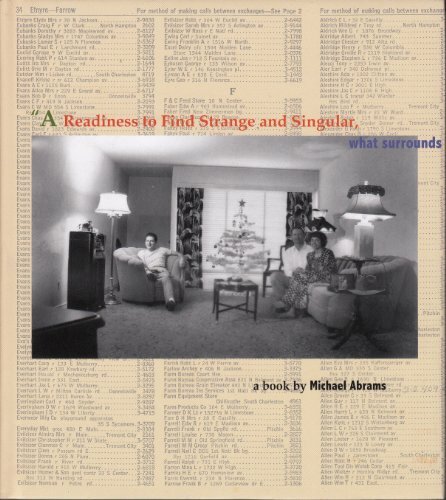 This first book by Michael Abrams is an album in which the artist's image makes only a fleeting appearance, yet whose hand touches every page. A journey informed by a quote from Michel Foucault… 'a readiness to find strange and singular what surrounds us; a certain relentlessness to break up our familiarities and to regard otherwise the same things; a fervor to grasp what is happening and what passes; a casualness in regard to the traditional hierarchies of the important and the essential'. Abrams sifts through the trove of discarded images that define our past and re-edits them for a new purpose. His goal - to provoke, question or demand reconsideration of our established assumptions. If not initiated by our curiosity, if not what surrounds us everyday, if not that which we might turn on its head, then what?